Bonus Feature #1 Free Spins. 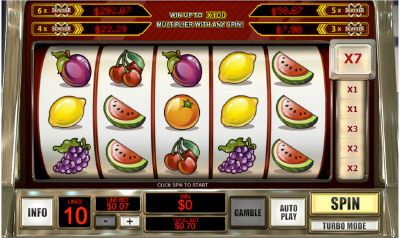 The free spins bonus feature comes in 2 versions. If you get wild symbol on center position on reel 3, the entire reel will expand and you will get 2 free spins for a better chance to win. A wild on an on reels 2,3,4 will turn all three center reels wild and you will get 1 re-spin. The second version is the normal free spins mode. The free spins feature is triggered when you 3 scatter igloo symbols. 10 free spins are awarded with 3X multiplier. You may win unlimited additional spins during this feature. Bonus Feature #2 Ice Run Bonus. This is a you pick the winner type of bonus. By a special symbol on reels 1+5 triggers this bonus. The snowmen give you cash awards, while the igloo provides you with a multiplier. During the snowmen stage a snowball feature can be triggered randomly, awarding you with all the prizes behind the 7 snowmen. Multiplier Madness can now be played at Fly Casino! This is a really fun fixed 10-line progressive slot game that rewards you a NEW multiplier from 1X to 100X on every spin! Four Progressives. There are four progressive jackpots that you can win by landing three or more scatters during your play. Based on pre-release VIP member reports, we can tell you now that these progressives hit often and with ease! Try Muilplaier Madness at Fly Casino and win a progressive! 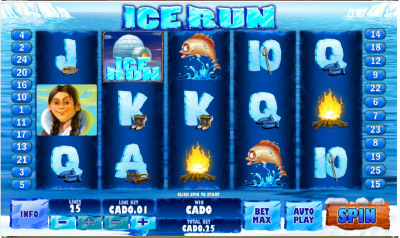 Ice Run New Game Bonus! From 00:00GMT until 23:59 GMT, all members are invited to receive a 150% bonus up to $/£/€150 on your first deposit of $/£/€ 30 or more. BIG BONUS TUESDAY! From 00:00GMT until 23:59 GMT, all members are invited to receive a 123% bonus up to $/£/€123 on your first deposit of $/£/€ 30 or more.